This client’s leadership team had an increasing desire to know how well the park and ride lots are being used. They needed a better way to consider the possibility and practicality of downsizing or lowering their level of service within outlying regions of their service areas. 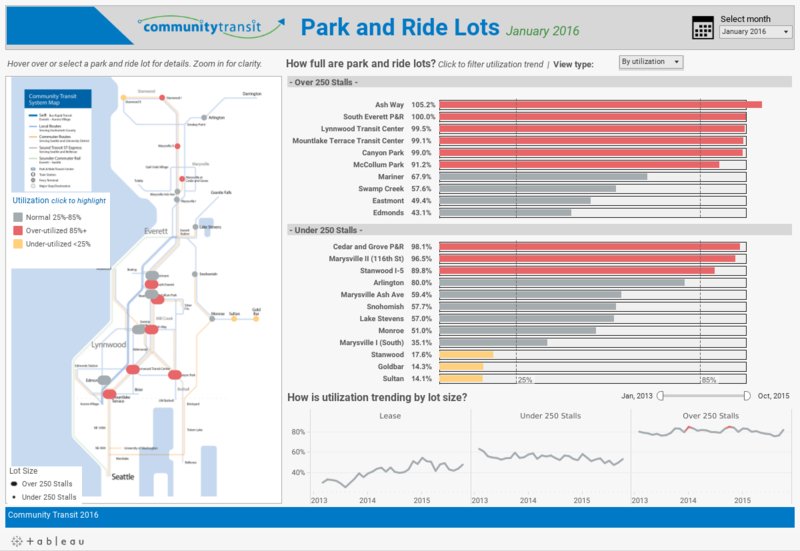 This dashboard displays key metrics that help the client compare the utilization of their park and ride lots. The tremendously flexible visuals helps explain which lots require more active management, such as supervising direct traffic flow, monitoring parking violations and/ or maintaining pay machines. Visualizations also help evaluate over-utilized lots needing expansion or under-utilized lots that may need to be closed.